Its time to dust off the boots and get ready for Rugby season 2019. If you are a brand new player or an experienced one the Noosa Dolphins Rugby Union Club are all-inclusive club. From juniors under 6 age there are pathways right through to our senior grades which includes A Grade, Reserves, Colts and Ladies. The Club also hosts the annual Noosa International Rugby Sevens. 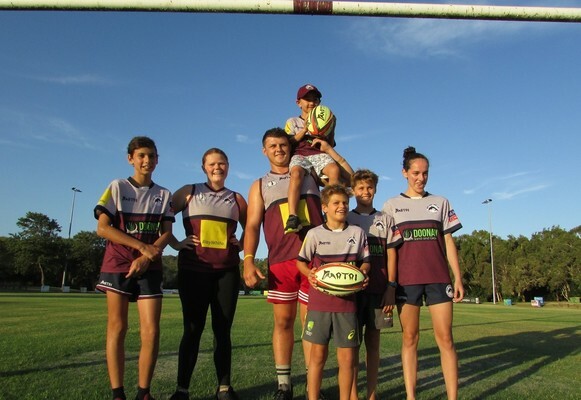 With seven a side Rugby Union becoming more popular the Club also has many boys and girls teams in all age groups in the Sunshine Coast Seven’s Competition. The junior and senior areas of the Club are supported by strong volunteer committees focused on the welfare of players. Club member Terry Hayes has played and coached at the highest level. “I am 81 years of age and every person I have been associated with the game of Rugby either playing with, against or as a member of a Rugby Club anywhere in the world are my friends forever. It’s not just a game, it’s a way of life and it’s available to you right here at the Dolphins,” he said. Junior sign-on and kit collection will be at the Dolphins ground, Bicentennial Drive Sunrise Beach on Friday 8 and 15 February from 3.30-6pm. Junior Pre-season fitness has commenced for U 11 upwards on Friday afternoons 4-5pm. Official training commences Friday 1 March.